A garden is a beautiful display of nature which you can personally create with lively coloured flowers, luscious greenery, water features and the addition of wildlife. Attracting birds is a wonderful way to complete the fresh, outdoor scenery. 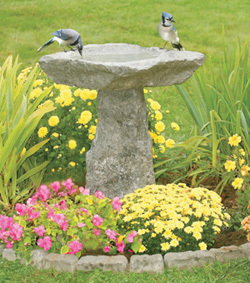 The easiest way to invite birds to your yard is to add a birdbath where they can visit every day for refreshment. In doing so, you will need to remember to keep it far enough away from the house that the birds will not be afraid but close enough that they feel safe from predators. Keep the water fresh by adding a dripper, mister or bubbler to create motion. Supply a perch for the birds such as a small tree or shrub. The need for shelter is a basic requirement for birds to feel safe and often adding a birdhouse or nesting box will do the trick. Since different birds gravitate toward different forms of shelter, observe and decide what type of birds you want to attract and build a nesting area accordingly. New birds will be drawn to your yard, and they are likely to stay with the installation of a bird feeder. Offering specialized foods will actually attract a wider variety of species. Black oil sunflower seeds attract songbirds, woodpeckers love suet, and blue jays and magpies prefer nuts of any kind. Scraps of food such as bread, rice or pasta are particularly enticing for birds but just remember to offer scraps in small quantities to avoid attracting rodents or other predatory animals. Changing the style of birdfeeder occasionally or varying the location around the garden will keep the birds interested in returning to your yard. There are particular plants and shrubs that can be added to encourage the birds to visit your yard, stay and return if they do leave. These include shrubs such as sumac or boxwood and small tress such as the dogwood. Birds are especially drawn to anything that bears fruit such as berry bushes, hawthorn or crab apple trees. Annuals that produce seed such as sunflowers, zinnias and marigolds are a favourite for many bird species. To summarize, remember the three basic needs for birds to be attracted to your yard; food, shelter and clean water. But what about the winter months? Birds need to be feed constantly to survive the cold weather. Small birds expend more energy in the winter and for that reason they cannot be left without some source of food. A variety of bird feeders should be placed where they are easy to find. Even though birds still need water, they naturally conserve water in their bodies and can usually get what they need from melting icicles and snow. Evergreen and pine trees are best for shelter and the pinecones add an additional food source. Deadheading is the gardening term used for removing old flowers that have started to lose its petals, or turn brown and soft. Dead or dying flowers are also referred to as spent flowers. A mature flower will naturally cultivate seeds causing the plant to ripen in preparation for latency, and next season's growth. Once an annual flower blooms and sets seeds, its life cycle is completed. Deadheading disrupts the natural cycle of the plant disallowing it to set seed resulting in an extended blooming period with the production of new flower buds. Also, deadheading simply improves the overall appearance of the plant and flowers making your garden more fresh looking and ecstatically appealing. Removing spent flowers is not a difficult job. If the flower is extremely soft you can basically pinch it off the stem, otherwise you can use scissors or a hand pruner to snip them off. Once the flower is removed, clip the flower stem just above a leaf or bud. Any damaged leaves should also be picked off at this time. Deadheading is especially important for larger plants such as hydrangeas. When they are finished blooming, they can be rigorously cut back leaving only two buds. 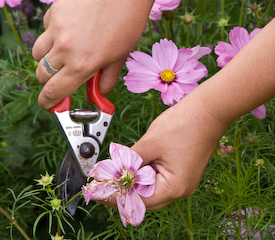 The task of deadheading can become tedious if it is not a regular part of your gardening routine. Start as early in the season as required with the maturation of your plants, with an extra effort in the month of July, which is the month when you will notice the most growth activity in your garden. You should stop deadheading in September allowing plants, especially perennials, to wither and dry out in preparation for the next growing season. If you decide that you want to save some seed from your favourite plant, don't cut off the dead flowers but instead let they dry out, and then collect the seeds and store them for the future. Purchase a greenhouse 240 square feet or smaller between July 5 and August 5, 2012 and receive 2 free solar powered automatic side vents absolutely free! That's a value of $340.00! Purchase a greenhouse 240 square feet or larger between July 5 and August 5, 2012 and receive 4 free solar powered automatic side vents absolutely free! That's a value of $680.00! Special does not apply to the Sun Garden or Legacy greenhouses, or our tubular or superior frame greenhouses. If manual side vents are preferred they will be supplied at the same value amount and no credit will be provided. Purchase must be made between July 5 and August 5, 2012. Value can only be applied toward side vents and no other products or accessories. This offer does not apply to any portion of exhaust fan systems.